​Are We the Right Music School for You? ​We have helped hundreds of students with their musical journey. We offer private lessons in many popular instruments, including voice. We know you are busy and we know it can be crazy hard to find a reliable music teacher. That's why we go above and beyond to find the BEST music teachers in the entire Logan area --so you don't have to! 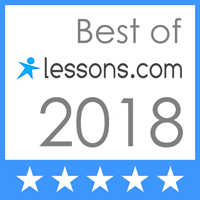 We were awarded "Best Lessons 2018" by Lessons.com AND we were voted "Best Music Program 2018" by Cache Valley Family Magazine. Many of our students think we are so great that they've referred their friends to come for lessons too. You can't ask for better endorsements than these. Our staff consists of experienced music teachers, many with advanced music degrees, capable of teaching all ages and levels. We are constantly improving our facilities and we provide on-going support to our instructors to ensure we are always providing our students and parents with the best possible musical experience. While you're researching the best school for you, consider the benefits of becoming a Logan Music Academy student and find out why we are your number one choice for music lessons! 1. Lessons for Piano, Voice, Guitar, Violin, Cello, Drums & Uke-- in one location. We can save our students both time and money when family members take multiple instruments on the same day. Other studios may offer multiple instruments, but we are the only one to offer all of the most popular instruments in a high quality, convenient environment. We welcome all abilities, from beginners to advanced--no matter what your age! 2. The most qualified teaching faculty in the area! We handpick the best teachers available so your student can have the right personality and the right teaching style that works for them. All of our teachers have teaching experience, a degree in music or extensive performing experience, and most importantly, a fun, motivating personality that you're sure to love! No matter what your musical goals are, we want to help you reach them! Our goal is to inspire your student--and that's the best teaching method of all! 3. A wide range of lesson times available, sure to fit any busy schedule! Visit our testimonial page to see what our students are saying. Every year, aspiring music teachers start their own studios, and a few months later they have to close. We have a proven track record of offering quality guitar, voice, singing, piano and drum lessons in Logan, year round. Our full time mission is teaching music lessons, trusted by hundreds of families! We aren't going anywhere! 5. A comfortable waiting room for parents. With over 2000 square feet, we have the most spacious and parent friendly waiting area in the Logan area. Instead of waiting in a music retail store showroom, in the car or a cramped hallway, our clients enjoy a spacious, professional parent's lounge with comfortable chairs, kids toys, free wifi, magazines and bottled water service. We also provide large observation windows for every room so that you can watch your child's lesson while you wait. Or if you prefer, you can sit in on the lessons at anytime. Our rooms are stocked with everything you need for lessons,including amps, full drum kits with pads, keyboards, pianos, and more. We have spent thousands of dollars on our studios to ensure you have everything you need for the best music lesson experience around! Every parent just wants to know how their child is doing and if they are really progressing, right? The best way for a parent to understand if their investment in lessons is really worth it is to have their child participate in a recital. In June and December, most of our students choose to perform in our biannual recitals. Our recital location has a grand piano, so piano students are not playing on just a keyboard. Our sound system ensures a quality experience for all! Unlike other schools, parents never have to pay admission or any related fees for these recitals. 8. Professional office staff to serve you. We strive to bring you the best customer service possible. We are continually adding hours to ensure that our desk staff is able to assist you when you call or come to the studio! Most music lesson providers do not provide front desk staff, but we have desk staff who are available at the front desk to assist you during ALL lessons, quickly and professionally. Excellent customer service is what sets us apart! 9. Conveniently located on 3002 North Main St. in North Logan! Due to its central location, our school is convenient and draws students from the entire area. We are easy to find, right on North Main Street, in front of the new Green Canyon High School. Access roads have been improved and now you can reach us from the East, instead of only from the highway. (turn onto Wolf Pack Way at 2500 North, continue to 3100 North round- a- bout and follow the road to our grey building with bright blue roof) The new stop light is now working and it makes our access even better. 10. Early morning and lunch time lessons for homeschoolers, retirees, college students and working professionals. We are a 'full service' music school. This allows us to offer lessons as early as 9 a.m. and we see can see students at lunch time between the hours of 11 a.m.-2 p.m.( Right now these times are offered on Thursdays) If you are a homeschool parent, retiree, college student or working professional who has a flexible schedule, take advantage of our early morning and lunch time lesson spots. 11. Month to Month Lessons! Our desire is to inspire our students with the love of music. We do this through teachers and music that our students love. Unlike other programs, we do not require semester minimums for lessons. You can begin anytime! To stop lessons, we just need a withdrawl form by the 15th of your last month. 12. Student recognition makes your child feel like a winner! and we make sure they get it!